Joseph Esherick's legacy of research and technical considerations that can inspire design continues. Sustainable strategies are often considered an innovation of the 21st century. But the history of sustainability reaches back to pre-industrial building types such as tents, igloos, and icehouses, which control their interior climates through simple means and respond to a specific climate and site. Only with the industrial age did buildings become isolated from their environment, using mechanical and electrical means to control ventilation, temperature, and lighting, and relying on manmade building materials not always best for the environment. By understanding that sustainable issues are part of a long tradition of people’s efforts to live comfortably in harmony with their environment, designers can consider the challenges a source of inspiration. No matter the environmental constraints, a designer must apply known techniques to a great unknown – how can this design best respond to a specific program, a specific site, a specific climate? The California Bay Area has a longstanding tradition of design that responds to and integrates with the particular climate of the region. 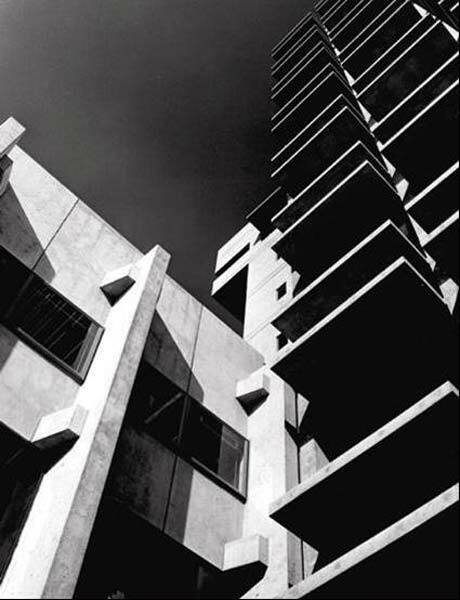 Joseph Esherick, FAIA, who founded San Francisco-based Esherick Homsey Dodge & Davis (EHDD) in 1946, was one of the best-known architects of the Bay Region tradition. 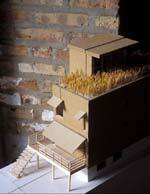 Esherick favored an economy of means, and believed that architecture should be a clear expression of tangible issues. A love for research, and for allowing technical considerations to inspire designs, has been a core element of the firm’s philosophy from the start. As early as the 1950s, the office performed sunshading and daylighting studies on all projects, using the results to shape the design. 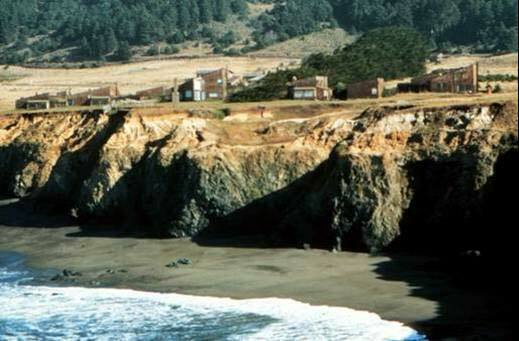 The Sea Ranch projects in the 1960s are classic examples – the designs grew out of detailed climate studies, wind tunnel studies, interviews with residents, and building science research. Sustainable design has become more high-profile in recent years because of a new urgency about environmental issues, as well as technological advances that offer architects a wider range of techniques to address them. Designers have become more aware of how buildings contribute to environmental problems, including the release of carbon dioxide and its impact on global warming. Using energy and water resources more efficiently has become more important. Five recently completed and forthcoming projects show EHDD extending Esherick’s legacy, combining both long-established and innovative ways of creating sustainable architecture. Sustainable design techniques were a natural choice for the Carnegie Institution of Washington’s new Global Ecology Center on the Stanford University campus. The Institution created the Department of Global Ecology in 2002 to increase understanding of the earth’s large-scale ecological processes, including climate change. The 12,000-square-foot facility, slated for completion this December, includes laboratory, office, and greenhouse space. The Carnegie Institution sought a design that would dramatically reduce carbon dioxide emissions, a major contributor to climate change. Energy use over the lifetime of a building is responsible for the most carbon dioxide emissions. To reduce energy use, the offices are naturally ventilated. To improve comfort, the design makes use of a compressor-less cooling method, an innovative night spray sky system designed by Rumsey Engineers and the Davis Energy Group. Late at night, sprinklers cover the roof with a thin film of water. Radiant cooling rapidly chills the water, especially on the clear nights that follow the region’s hottest days. This water is piped into a thermal storage tank. During the day, the chilled water travels through radiant tubing in the concrete slab throughout the building, and supplies the fan coil units to cool the 100 percent outside air in the laboratories. To enhance collaboration among scientists, laboratory doors open onto a central lobby for informal gathering. A cool tower connected to the lobby uses natural forces to make the space comfortable on hot days. “The cool tower is an ancient technology, from Middle Eastern desert climates,” observes Scott Shell, AIA, a senior associate at EHDD. “It’s just starting to be used in the West.” The height of the tower catches the stronger prevailing breezes 35 feet off the ground and directs them down into the space. Misters at the top of the tower evaporate water into this air stream, cooling the air up to 15 degrees. The building’s total energy consumption is estimated to be 50 percent lower than required by California’s strict new energy code. To further reduce carbon dioxide emissions on this project, more than half of the cement in the concrete is replaced with fly ash, a waste product from coal-burning power plants. Manufacturing cement releases eight percent of all global greenhouse gases, according to Shell. EHDD has pioneered high fly ash concrete that cuts this amount in half. The fly-ash concrete will be tested to see if its dramatically lower permeability will reduce the need for expensive floor sealers below impervious floor coverings. 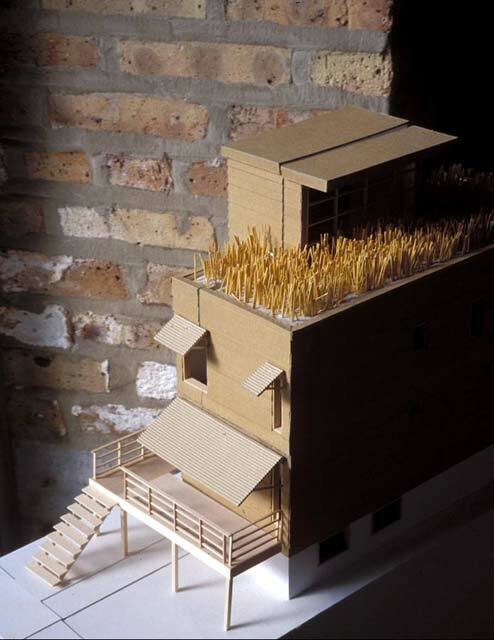 A grass roof that promotes cooling and insulation and a wall lined with bottled water are among the innovative strategies of EHDD’s Factor 10 House, an affordable, energy-efficient, single-family residence currently under construction in Chicago. The house was one of five entries selected from a field of 73 to be built in an international competition held by the city. The design seeks to reduce environmental impact by a factor of 10 compared to the average American home. Designed by EHDD’s Chicago office, Factor 10’s 1,200-square-foot modular design and open plan is intersected by a solar chimney, topped with a clerestory window. The south-facing window controls light carefully, bringing daylight to the core of the house, and reducing the need for artificial lighting. A whole-house fan in the chimney pulls warm air up and out of the house in the summer, and pushes warmed air down in winter. Maximum insulation and careful placement of the windows further reduce energy consumption. Materials were selected for their extended life spans and low-impact initial production. The design incorporates recycled materials in a variety of ways, the most notable of which is a wall of recycled water bottles filled with City of Chicago water that serves as a heat sink in the solar chimney. Porches have metal awnings, further enhancing the house’s energy efficiency. The grass roof counters the effects of heat gain through evaporative cooling, thereby reducing energy consumption. It also extends the roofing membrane’s life span by blocking destructive UV rays; reduces the impact on the city sewer system by absorbing and retaining storm water runoff; and converts carbon dioxide to oxygen, all while looking beautiful. The home also uses high fly ash concrete, and includes a wraparound deck constructed from Ipé, a certified Brazilian hardwood that naturally resists rot, decay, insects, and mold without using toxic chemicals, unlike other decking products. As the newest campus of the University of California system, and among the first major research institutions to be built in the 21st century, UC Merced is committed to being a model of sustainable design. The Science and Engineering Building is one of the campus’s first three buildings. In collaboration with Arup Engineers and the California Institute of Energy Efficiency, EHDD developed a design that exceeds California’s strict new Title 24 energy code by 30 percent. Laboratories in general tend to use four times as much energy as a typical university building, since codes require 100 percent outside air and high ventilation rates. And in the hot California Central Valley, keeping cool can be a huge energy drain. For these reasons, the mechanical system offered the most opportunities for reducing energy use. The central plant has a thermal energy storage tank so chilled water can be produced at night, when electrical demand is low. This chilled water is supplied to air handlers in the laboratory building for cooling the building and process equipment. A careful selection of filters and coils, and generous duct sizes that allow use of smaller fans, also save energy. Accurately estimating the internal heat load from the lab equipment avoided excess air conditioning capacity. Fume hoods use variable air volume controls to minimize exhaust rates. Office and conference rooms are separated from the labs so they can have operable windows and natural ventilation. 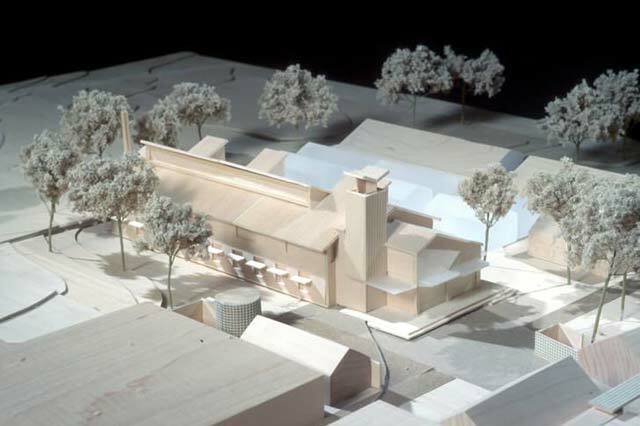 EHDD also developed a three-story arcade with glass sunshades to shield the southeast and southwest façades. 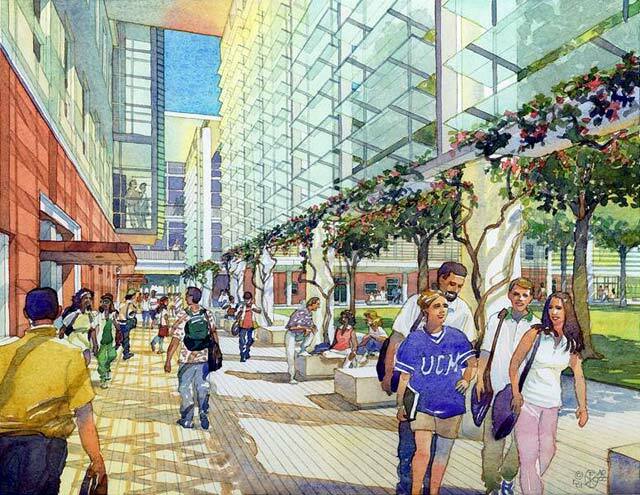 The 170,000-square-foot building is scheduled to open at the end of 2004. Photovoltaic panels provide all electricity. The key to using photovoltaics without spending a fortune is to inventory all electrical loads and significantly reduce the demand. The inventory for the Audubon Society identified several large energy users, including a vending machine and a pump on the courtyard fountain. No efficient vending machines could be found, so this feature was eliminated. A redesigned fountain and pump reduced energy requirements from 100 kWh per day to 7 kWh per day in the winter. The building’s overall electrical demand was reduced to 50 kWh per day, 60 percent better than required by Title 24. The Interpretive Center includes one large conference/classroom that is frequently used for large groups and late afternoon board meetings. Mechanical cooling proved necessary for this space. Using an absorption chiller driven by solar hot water panels avoided a significant increase in photovoltaics. All wastewater is treated in a biological treatment system. During the first year, water reclaimed through the treatment system will be used only for subsurface irrigation. The county will monitor the purity of the water, and if it meets the standards expected, it will then supply toilets. Dual-flush toilets and waterless urinals further reduce water use. 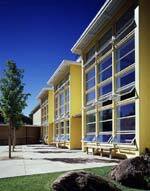 The program for the new Ross School in Ross, California, originally called for nine air-conditioned classrooms. But the budget would only support eight. EHDD proposed eliminating air-conditioning entirely to make the ninth classroom affordable. The primary challenge was to keep the 16,000-square-foot building cool during Ross’s hot fall months – without expensive and elaborate technologies. The first task was to reduce heat gain from the outside. The design shades windows using exterior sunshades, new and existing trees, and three-foot-deep overhangs at the second floor. In areas where the glass isn’t fully shaded, spectrally selective glazing reduces heat gain by 50 percent, while letting in almost all-visible light for daylighting. The flat roof portions of the building use a “cool roof” with a white, high-performance coating to reflect 95 percent of sunlight. The building is also designed for enhanced natural ventilation, with cross-ventilation in the second-floor classrooms, and stack ventilation chimneys in the first-floor classrooms. On the hottest days, the design relies on night-ventilation cooling to enhance comfort. Cool night air is admitted to the classroom to lower the temperature of the exposed concrete topping slab. 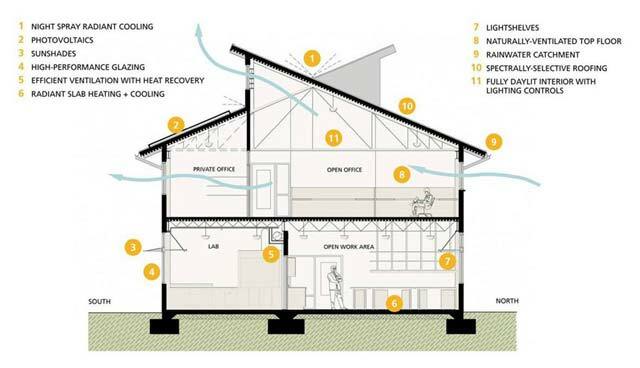 This thermal mass provides radiant cooling for occupants on the following day. The building was completed in 2000. Sustainable issues are part of a long tradition of people’s efforts to live comfortably within their environment. And in a world of increasingly scarce natural resources, they are essential to maintaining the quality of life on this planet. But there are also incredible aesthetic benefits to green buildings: open, day-lit spaces that reveal the beauty and function of the structure and all the systems. Esherick Homsey Dodge & Davis (EHDD) has a 57-year history of designing buildings that are empathetic to site, context, and client needs. 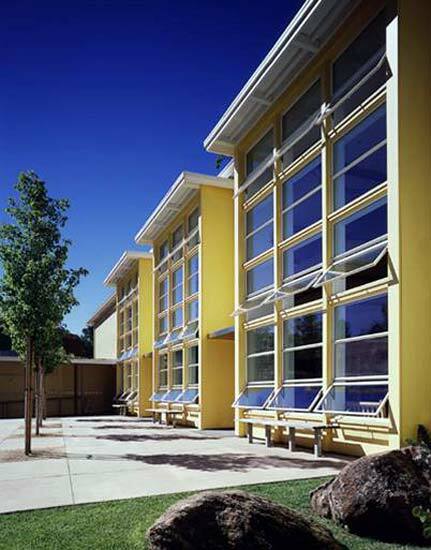 Established by Joseph Esherick, EHDD has won the highest honors of the American Institute of Architects: the Firm of the Year Award; the Gold Medal, conferred upon Joseph Esherick; the Architectural Firm Award; and the Bernard Maybeck Award for Chuck Davis from the AIA California Council. Ron Nyren is a writer based in the San Francisco Bay Area. 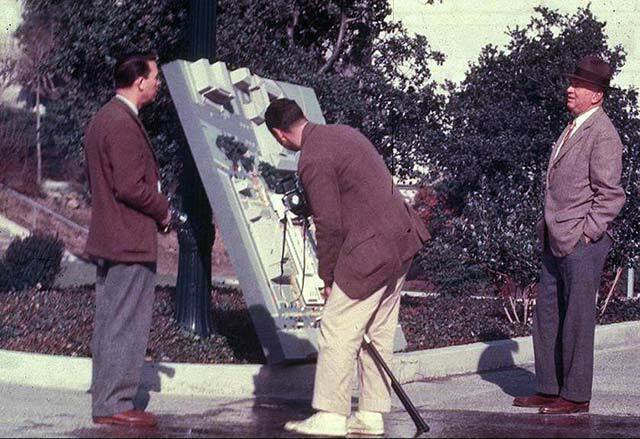 EHDD founder Joseph Esherick (center) outside Wurster Hall, University of California, Berkeley in the mid-1960s, using a model to study sun angles and shadows. 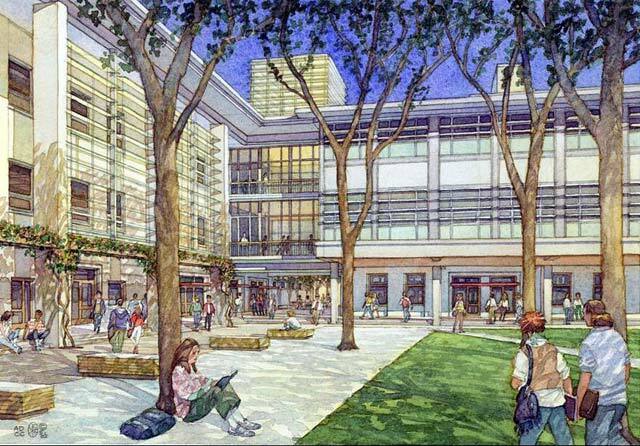 The design of UC Berkeley's Wurster Hall uses sunshading, daylighting and environmentally sensitive structural systems. Joe Esherick was on the team that designed the building in 1963. At Sea Ranch on California's Sonoma coast, the concept of letting the site and environment shape buildings is reflected in the form of the early buildings, which respond to the cold and windy climate; houses reflect the sloping hedgerows. 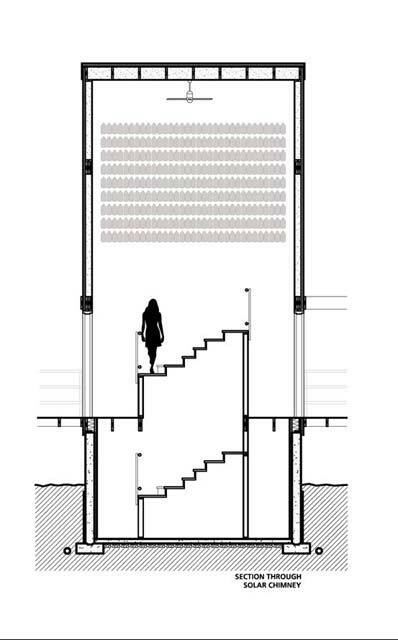 Global Ecology Center's cool tower provides passive cooling to the building's lobby, and serves as a marker to draw visitors into the courtyard. 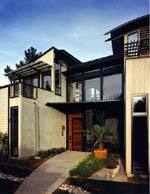 An outline of sustainable design strategies used at the Global Ecology Center. 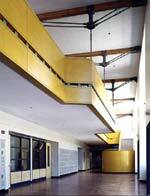 The building's long, thin footprint facing north and south offers ideal daylighting and cross-ventilation. UC Merced's Science and Engineering Building receives strong, direct solar gain at the southeast and southwest. To reduce energy use and create a more habitable exterior space, a large arcade with glass sunshades runs the length of these elevations. 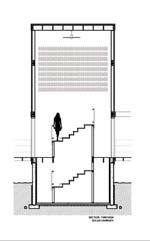 The Ross School courtyard elevation has operable windows at high and low levels for good stack ventilation. 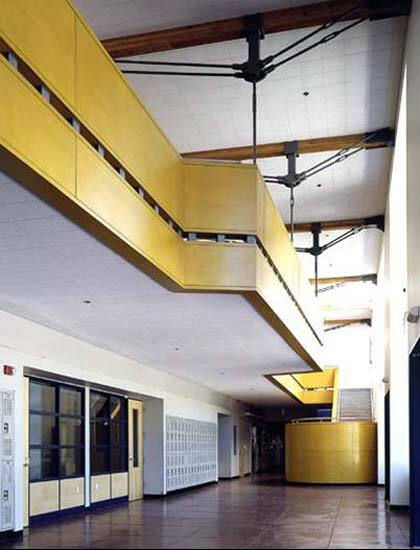 Ross School's large sidelights bring balanced light into classrooms; exposed concrete floors contain radiant heating tubing and thermal mass for night ventilation cooling. An exterior screen wall modulates natural light in Valparaiso University's new Center for Information Resource. The wall provides solar control, reducing glare and direct solar gain. A cross-section of the Computer History Museum depicts the sloping grass roof that shields the building from solar gain and becomes an architectural feature visible from the freeway. This single-family residence in Palo Alto, California exemplifies environmentally sustainable architecture by integrating sustainable materials and systems, such as photovoltaic panels, grey water collection, cellulose insulation, and low-e glass.